One Sunday, SpongeBungot Squarepants, Patrick Star, and Sandy Cheeks, residents of the city of Cebukini Bottom, decided to go southwest for a change of scenery. 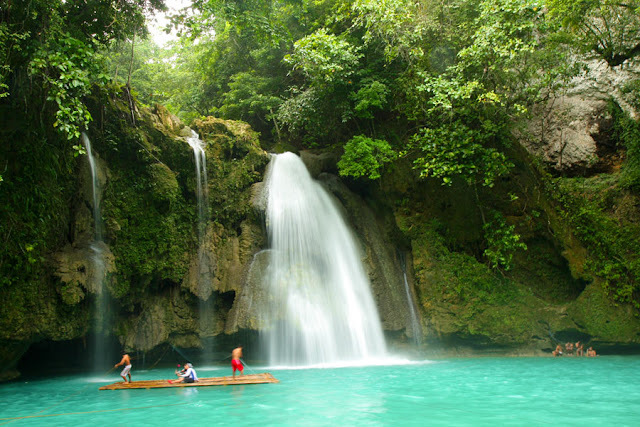 Not being able to survive out of water for too long (except for Sandy Cheeks, who can just take that fishbowl off her head), they chose Kawasan Falls in Badian and Mantayupan Falls in Barili; places where both landlubbers and aqualungs can enjoy. 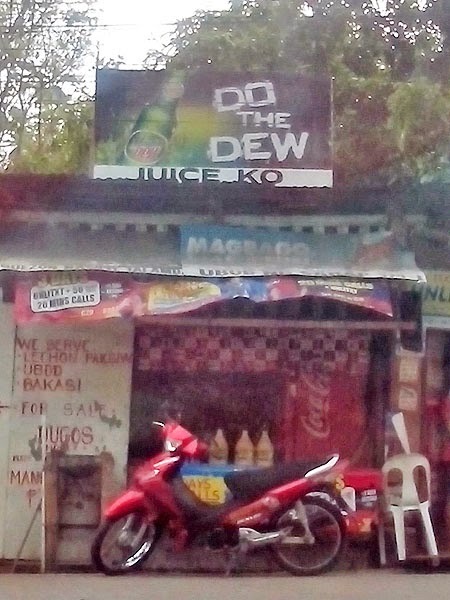 After the 2.5–hour bus ride (Php 126) from the city, they had to rehydrate ASAP. SpongeBungot and friends hurried along the 1.5 km path to the falls. (They could have hired a motorcycle to get them to the waterfall faster but 1.5 km is nothing said their legs.) When they reached the waterfall, they oohed and aahed (Sandy Cheeks most of all because it was her first time there), dipped their toes in the cold water, but decided to head to the upper level. At both levels, there were lifevests for rent (Php 50), bamboo rafts (for a fee), tables and chairs for rent (Php 300), food for the hungry (meals for Php 100, and a la carte orders from Php 150 to Php 300), drinks for the thirsty (bottled water Php 50! ), and showers (Php 10) and toilets. 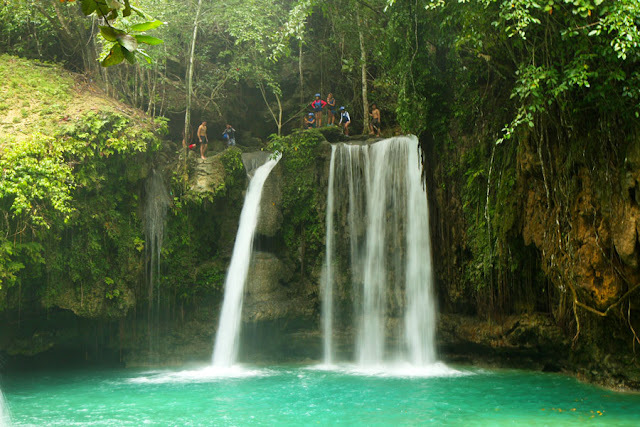 SpongeBungot and friends settled at the second level (another level up would be the water source), where they refueled with some carenderia type food at restaurant level prices, then rehydrated in the icy turquoise water while observing adrenaline junkies either steel themselves for a 35–feet plunge or backpedal from the edge in defeat. 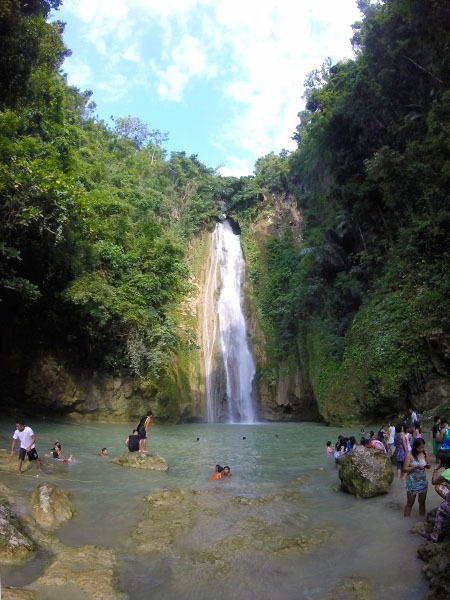 From the highway in Matutinao, Badian, SpongeBungot and friends rode a bus (Php 54) to Barili, where they were dropped off at the town proper, and then rode a habalhabal (motorcycle, Php 30) to Mantayupan Falls. 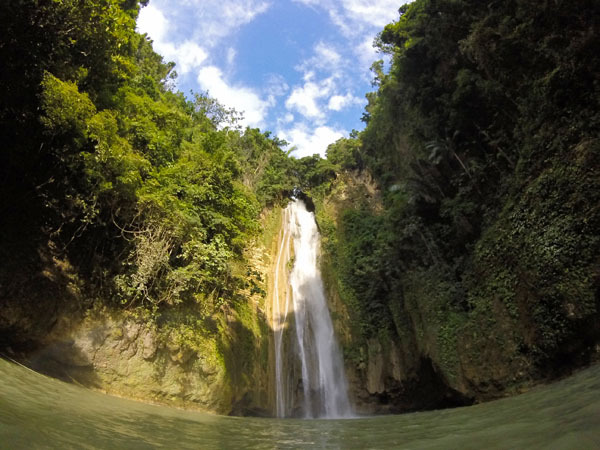 From the entrance, where an admission fee of Php 20 was collected, it was just a short walk to the waterfall. Just a few steps from the entrance, the three friends spotted a sari-sari store, some shower rooms and toilets, and some rooms for overnight stay. 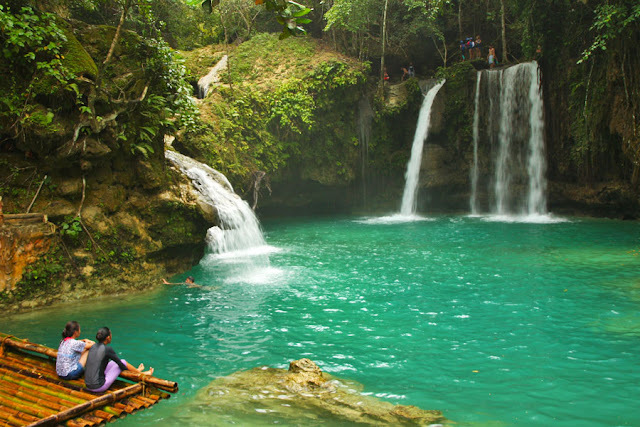 Then they crossed a narrow steel footbridge over a nice aquamarine pool, then mounted some steps that led to the 98–meter tall Mantayupan Falls. The waterfall was crowned by the blue sky, flanked by greenery on both sides, and welcomed by a pool of water at the bottom. On the rocks and among the boulders facing the waterfall, tables and chairs were set up for guests who paid to rent them and then put away when those guests had gone home. SpongeBungot and friends paid for some chairs (Php 10 per chair) to put their bags on to keep them dry, then joined the landlubbers in splashing about and soaking themselves in the cold waters of Mantayupan. When the landlubbers have packed up and left, the three friends were still in the water. Then Time and Darkness ganged up on them. The shivers seeping through their bodies together with the creeping darkness told them to go away. Time and Darkness would tail SpongeBungot and friends all the way home to Cebukini Bottom (bus from Barili to Cebu, Php 72). Don't cram ten spots to see in one day. Or five for that matter. Each place is meant to be savored. Cramming too many things to do in one day, especially when traveling with a group, will be difficult, because not everyone will be as determined as you. Unless your group is used to traveling a la tour package, then you can act like a general and give a time limit for each place. In every place, snap some photographs but don't limit your view through your camera. Put down that camera. Breathe. Take it all in. Walk slow. Look around. Don't rush. Relax. You're on vacation.